Vehicle accident damage to internal organs, such as the kidneys, can be devastating. The kidneys are two of the body’s most vital organs, and they're extremely vulnerable to injury in a collision. Bean-shaped and protected by the rib cage, each kidney is about the size of a fist. They're responsible for regulating the composition of the blood, blood pressure, and the removal of waste from urine. Blunt trauma. Blunt trauma kidney injuries are typically caused by impact from objects that don’t break the skin. There are often no outward signs of blunt trauma, but bruises sometimes appear on the back or in the abdominal area. The most obvious sign of blunt kidney injury is blood in the urine. Most blunt renal trauma can be treated through observation and bed rest. Deceleration trauma. When a rapidly-moving vehicle stops suddenly, occupants may experience an impact injury known as deceleration trauma. This force shifts the kidneys inside the body, ripping them loose from blood vessels and causing internal bleeding. As with blunt trauma injuries, this damage can typically be treated with plenty of bed rest. Penetrating trauma. These injuries are typically more obvious than those created by blunt trauma, since there's an external wound due to an object colliding with and piercing the body. Treatment of penetrating injuries usually requires surgery, and immediate surgery may be required in the event of excessive bleeding. One common procedure is a laparotomy, which involves inserting a tiny camera into the abdominal cavity through an incision. 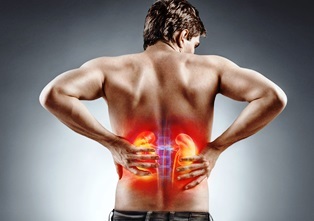 If you’ve suffered kidney damage due to a vehicle accident, you may be entitled to receive compensation for your medical expenses, loss of income, and pain and suffering. You need an experienced vehicle accident attorney to help you receive the compensation you deserve. To learn more, contact the law offices of Steve M. Lee, P.C., by using the form on this page.